Cabinets come ready to assemble. Easy to follow installation instructions are included in boxes. Only a screwdriver is needed to complete assembly. Prepare to be seduced by the luxurious offering of welcoming warmth that gracefully radiates from the rich glow of Oak Shaker Kitchen Cabinets. Truly… there's no better way to enhance interior design up several antes than with this premium collection of RTA cabinets. Made from Oak, the benefits extend to natural strength and proven durability allowing your cabinetry to efficiently stand the test of time. 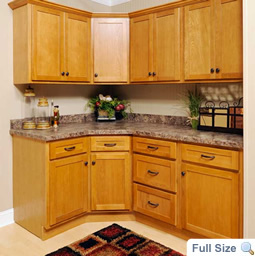 And now that you are ready, Craftsmen Network is here to help you realize the kitchen of your dreams. Oak Shaker Kitchen Cabinets brandish the exquisitely bold grains of Oak that flaunts beautiful transitions making each and every length of your cabinet units unique. This distinctly daring natural character is mellowed, while at the same time accentuated, by the glaze of golden honey that generously lathers the façade. These aesthetic features are made all the more interesting as well as practical by the integration of shaker style that greatly manifests the efficient integration of both form and function. 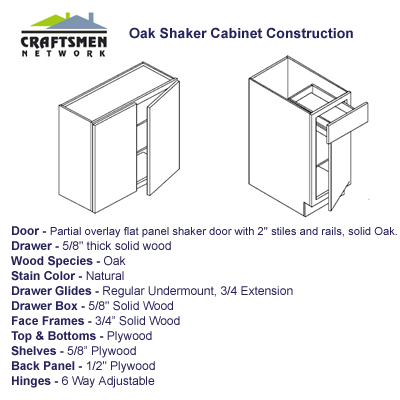 Manufactured only from the finest of raw hardwood materials, showcasing cutting-edge design and construction, Craftsmen Network indulges your senses with the beauty of Oak Shaker Kitchen Cabinets while sufficiently satisfying your family's needs for a functional kitchen. 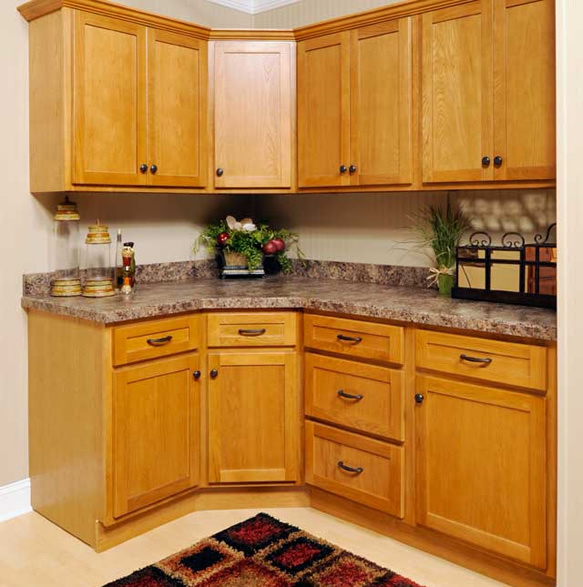 This premium line of RTA cabinets allow homeowners to enjoy all the benefits in the longest possible time, without the common home improvement worries entailed which mainly involves breaking the bank. If you want the best value for your remodeling money, then do not let this opportunity pass you by. Craftsmen Network's dedication to customer satisfaction will make your buying experience most convenient and truly worth it. So wait not another minute… Buy and grace the heart of your homes with your very own set of premium Oak Shaker Kitchen Cabinets.